When I left for my first mission trip, I heard people refer to it as an “immersion” experience. 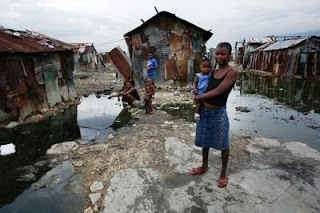 I didn’t realize how accurate that word was until I landed at the single runway airport in Port-au-Prince, Haiti and was driven directly into Cite Soleil, the largest slum in the Western Hemisphere. I was thrown into the mix of natural beauty and abject poverty of the island country; the palm trees and the tropical heat surrounded garbage filled streets that were shared by stray animals, children playing and women selling mud pancakes as a “dietary supplement”. They were literally eating dirt mixed with a little oil and salt to fill their bellies. The Missionaries of Charity Sister’s Nutrition Center was an oasis of calm – a welcome relief for someone in culture shock! Although I gave a piece of myself to many of the children that I met there, one stands out because at first, I tried to avoid him. Finally, I reached out my hands. He immediately lifted his arms to be picked up unlike many of the other children who were so lethargic. He wrapped his arms around my neck, snuggled into me and fell asleep. His heartbeat and deep breathing were a relaxing rhythm and I swayed back and forth, as any mother would. I came to realize this baby symbolized all of Cite Soleil to me. On the outside, he looked ugly, even gruesome. I wanted to look away. But as I released my fears to God, I found that on the inside was all the sweetness and love that one would expect to find in one of His creations. So it is with Haiti. By looking past the existing poverty and newly wrought devastation, we find our brothers and sisters in need of someone to show them who God really is: love. 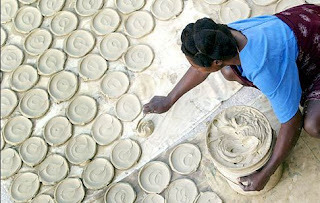 To learn more about how to have a Heart for Haiti and donate to the Pontifical Mission Societies long-term Haitian Solidarity Fund for the recovery of the Church after the intial relief effort, go to http://www.propfaithboston.org/Boston/propfaith.html . Regular readers know that I often make references to Haiti. Whether it is as part of a Holy Childhood presentation in a school or parish, highlighting a missionary’s work there or thanking the people of Boston for gifts that have made their way to that beautiful island, Haiti never leaves my radar screen. This is because my very first trip for the Pontifical Mission Societies was to Haiti. My heart never came home. During that trip, Haiti was much as it was on the day before the earthquake: profoundly poor and struggling. It had a low literacy rate (about 52%) and an even lower per capita income: more than half of Haitians lived on less than $1 a day. Some people would call a place like that hopeless. The missionaries I met and worked with called it fertile ground. My host during that life changing time was Fr. Tom Hagan, OSFS. His house, now destroyed, was our base as we saw schools, orphanages, clinics and feeding programs. My experiences there were profound. I bandaged and helped stitch up patients in a “Wound Care Clinic” for the homeless of the capital city – really nothing more than a stoop in an alley where people knew they could get some form of medical care. Other than kissing my children’s scraped knees, I had no training. In that dirty alley, I received more than I could ever give: the opportunity to serve Jesus in my brothers and sisters. I praise God that Fr. Tom survived; he already has a plan to begin the recovery process. But he and missionaries like him will need our help long after the earthquake has dropped off the front pages. For that reason, the Pontifical Mission Societies in the USA has established a long term Haitian Solidarity Fund. and please, leave your heart there. While out preaching around the Archdiocese to bring the Mission Message to our parishes, we’re very frank: we need your help. The Propagation of the Faith, the Holy Father’s Mission Society, cannot do the work the Pope asks of us without the assistance of all baptized Catholics. Your help can come to us in many different ways. The first is obvious and one that’s necessary: material support. The churches, schools and clinics that are built and the people of God trained to staff those facilities so that the Gospel can be proclaimed are not without a price. We know you understand that – the people of the Archdiocese of Boston have been very generous over the years in the pews, through our mail appeals, in the purchasing of our Mass Cards and Spiritual Enrollments, and by leaving us a legacy in their will. We thank you for your continued support. What we find ourselves in need of at this moment is something that money can’t buy – you. The missions need each of us to give not only of our treasure, but our time and talent as well. We would happily accept any contribution to our Mission Family that you could make. Are you available once a week? Once a month? Quarterly? You would be a welcome addition to our home at the Archdiocesan Pastoral Center at 66 Brooks Drive in Braintree, MA. For more information on how you could help to make a real difference in the lives of those who live in mission dioceses around the world through volunteering for the Propagation of the Faith, go to our website at http://www.propfaithboston.org/. Watch the 5-minute video on the front page of who we are and why we see ourselves as a Faith Family. Then contact us by calling 617-542-1776 or email us at info@propfaithboston.org. We look forward to you joining our One Family in Mission on a regular basis! As a child, one of my favorite times of the day was when Mr. Buonomo, our mailman, would walk down the driveway. Although there was rarely anything for me, the possibility was still there and it made me skip to meet him at the mailbox. Somehow, mail call—even at work-- has never lost that thrill for me (although my office mates are probably grateful that I no longer skip to it!). The letters delivered now bring stories of the missions and the pictures that show how difficult the work of spreading the Gospel can be in remote areas of the world. Recently, I received a letter of thanksgiving from Fr. Lavaud Christophe of Château, Haiti. Fr. Christophe was ordained a priest early December 2008 along with two other men in the Diocese of Cayes. Because of the generosity of Bostonians who have given used vestments and altar supplies to our office, we were able to send each of these three men vestments of every color, a chalice, a paten and a ciborium to be used in their ministry. Fr. Christophe sent pictures of his mountain “parish”, explaining how these items would be impossible for him to have obtained any other way; the area in which he works is so poor that although they do have simple structures in which to hold Mass, there is no rectory or parish building. Religious education classes are held outside! And yet, as you can see from the pictures, the people he serves come in their Sunday best, hungry for the Bread of Life, thirsting for their children to drink in the proclamation of God’s Word. Along with the letter and pictures came something more precious: the promise of prayers. Fr. Christophe assured me that the people of the Archdiocese of Boston would be in the prayers of the people of Chateau parish. And that is why, although I’m not going to the end of the driveway, at least my heart still skips when I get the mail.